If you have an older home, you may have some gigantic, 1970s can lighting suspended from your track lighting system. They aren’t THAT bad, but they definitely and a retro feel to the room…and not in a good way. When people walk into your house, they notice the lights as relics of a past time, but you think it would take a lot of effort to install new lighting. In fact, if you have a much older home with a plaster ceiling, you make think of the prospect as a complete room renovation. Changing the lights in your track lighting is a simple solution, and those tracks can be easily updated! Cube light: Cube lights are low profile, and they add a modern, industrial flair to your room. If you have a Victorian kitchen, it may clash with soft lines and intricate details. However, if you have a modern, minimalist decorating scheme, cube lighting may be perfect. Cylinder light: Cylinder lights are basically the updated version of the can light. They aren’t the huge, soup-cans that use to fill open ceiling space. Today’s cylinder lights cast nice ambient light from small cylinders that can be very appealing in any type of room. Pendant light: If you are going for pendant lighting, the track lighting system should probably be a secondary light source. Pendants are often used for task lighting such as over kitchen counters or work stations. There are many types, so they can fit any decorating scheme, and they are perfect for getting worktop lighting without the shadows of overhead lighting. LED light: Just about every lighting system now comes in an LED version, and LED lighting has many benefits including energy efficiency, minimal heat loss, and rare bulb changes. They also come with extra features if you choose options with smart features such as color changing bulbs with remote access from smart speakers or smartphones. In order to choose a new track lighting system, you must carefully consider your lighting needs. Are you completely lighting the room with the track lighting? Is it for a specific task? Is it decorative? Not only will this help you pick out lights that are aesthetically pleasing, but it will also increase the functionality of the track lighting. For instance, light fixtures that hang low must have other lighting above it. You must also pay attention to beam angle on bulbs and, to a certain extent, on fixtures. Spot lighting is only good for very specific lighting needs, while flood lighting comes in various grades to get the adequate beam angle for the setting. There are a wide variety of options to make every light bulb and fixture optimal. If you are having any issues with your current track lighting with dated fixtures, they should be resolved prior to installing new fixtures. Any lose connections should be addressed, so if your lights are flickering, figure out why before updating. It could mean that you need to repair something, or you may need to replace your current tracks. However, if everything is working well, go ahead and place your new track lights. If you are using old halogen bulbs, you may need to pay attention to voltage to make sure you aren’t installing too many lights that would overwhelm the system. However, if you are replacing with LED, you’re probably A-OK. If you aren’t sure, call and electrician. It is always worth the expense to make sure electrical fixtures in the house are installed properly and in SAFE working condition. Once you get your new or updated lighting, it may not seem right when it is first installed. There are a lot of adjustments that may be required before everything is perfect. If you are installing direct lighting with a narrow angle for specific task lighting or narrow-angled lighting to brighten art, the adjustments may be pretty predictable. However, it gets more complex with total room lighting. For instance, if you are standing in your kitchen, you don’t want awkward shadows, but you also don’t want the light shining directly into your eyes. If you have an open-concept home, you may notice that one light shines right into your eyes while you watch television. 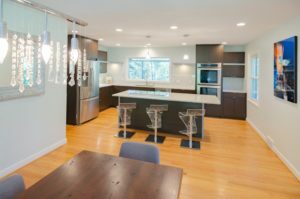 There are many adjustments that can make the lighting situation perfect, but you may need to consider more than track lighting to get you light situation the best it can be. 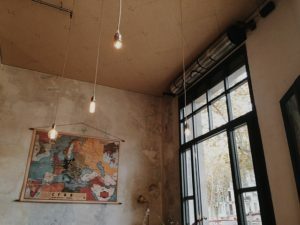 The point of this whole post is to introduce you to the alternatives available to old, dated can-lights that are taking away from the beauty of your home. It is a minimal investment to invest in new fixtures, and you may not even have to replace your tracks. There are many options available, and all of them are better than old can lights.